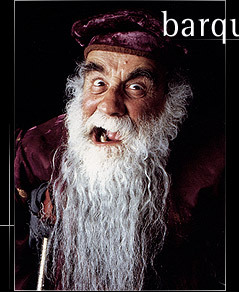 The diminutive, irascible, and powerful Barquentine serves as official guardian of castle protocol and ritual at Gormenghast, directing the Earl and his family in the traditions and superstitions that have governed the castle for hundreds of years. His stewardship is threatened when he takes on Steerpike as an apprentice. While studying nuclear physics at Oxford in 1944, Warren Mitchell met the actor Richard Burton, who convinced him that the theater would suit him better than science. In 1951 Mitchell began acting professionally, garnering his first break in the BBC's Hancock's Half Hour. Mitchell has since appeared on radio, stage, and television in roles alternately straight and comic. On stage, Mitchell received critical acclaim for his performance as Willy Loman in Death of a Salesman at the National Theatre in London, but he is perhaps best known as the bigoted, loud-mouthed Alf Garnett in the BBC series Till Death Us Do Part, the model for All in the Family's Archie Bunker.